Researchers have been kicking around the idea of a cranial porthole for years – a skylight for your skull that doctors could peer through to monitor brain cancer, or treat neurological disorders. But glass is too fragile, and traditional skull implants are opaque. Now, a team of bioengineers has developed an implant using a strong, transparent material that could make brain-windows a reality. Say you need to sneak a peek at someone's brain. Easy, right? Just remove a portion of their skull, get a good look at their gray matter, re-seal the brain case and go on about your business. But what if you need to sneak a couple of peeks? Or a bunch of peeks over time? Surgery – especially a procedure as sensitive as a craniotomy – is invasive, expensive, and inherently risky. A carefully placed window, right in the patient's noggin, could enable doctors to see clear through to the brain any time they pleased, no cracked-skulls required. But what might such a window be made of? Glass is out. Too shatter-prone. Here's a better option: a material known as yttrium-stabilized zirconia (YSZ). It's the same stuff used in hip implants and dental crowns. An incredibly strong and chemically stable ceramic, YSZ has been shown to play nice with biological tissues, which minimizes the risk of a person's body rejecting it following implantation. But there's a catch: YSZ, like many materials commonly used for implants, is not see-through – which, let's face it, is kind of a prerequisite if you want to install a window in somebody's brain casing. 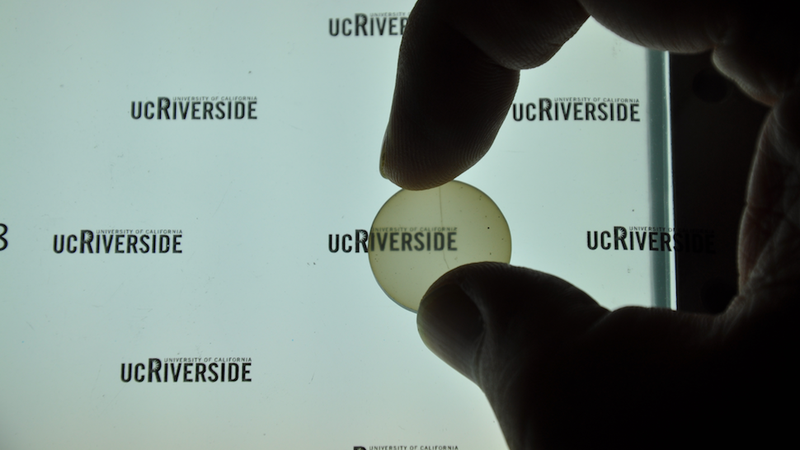 So a team of researchers led by UC Riverside engineer Guillermo Aguilar tried something new. Using a high-heat, high-pressure treatment known as the CAPAD process, Aguilar's team reconfigured the traditional YSZ's crystal structure to create a transparent version of the ceramic called nanocrystalline-YSZ (nc-YSZ), seen at the top of this post. The researchers then polished the nc-YSZ, machined it into tiny rectangular implants, and, in a process recounted in the latest issue of Nanomedicine, slotted them into the skulls of anesthetized mice, holding them fast with good ol' fashioned dental cement (see above). The new implants allowed Aguilar and his team to visualize the mice's brains using an imaging technique known as optical coherence tomography (OCT). OCT relies on near-ultraviolet wavelengths to produce detailed three-dimensional images of soft tissue like brain matter. But few things scatter light like a thick, bony skull. Performing OCT through an intact cranium, then, tends to muddy the observational waters. Performing OCT through a clear, nc-YSZ implant, on the other hand, yields significantly better results – a fact the team demonstrate in their publication. "This is a case of a science fiction sounding idea becoming science fact, with strong potential for positive impact on patients. "This is a crucial first step towards an innovative new concept that would provide a clinically-viable means for optically accessing the brain, on-demand, over large areas, and on a chronically-recurring basis." Read the full study in Nanomedicine.